The five Bury cyclists are pictured with the five members of Schorndorf's Team Jumelage (who accompanied them for the last part of the ride) being greeted on arrival in Schorndorf by Oberburgermeister Kubler. The above is a cutting from the local newspaper "Schorndorfer Nachrichten" published two days after arrival. A further report appeared in "Schorndorf Aktuell" on 14 June and the photo used in it is featured lower down the page. A full report on the tour written by John Butterworth can be read as a pdf file by clicking on this link: Bury to Schorndorf Ride Report. Photographs can be viewed on the 'Photo Gallery' page. The riders (from left): Duncan Limbert, Frank Jefferson, John Butterworth, Andrew Ascoft and Alan Webb. Our support vehicle driver was John Ratcliffe of Bury Metro Community Twinning Association. John had visited Schorndorf on previous occasions and speaks French and German. 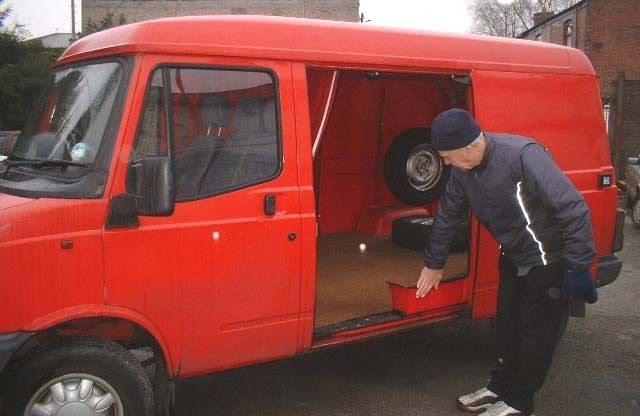 Frank inspects the van to be used as our support vehicle. This was supplied courtesy of Hedley Hill of Ainsworth Road Garage, Radcliffe. Above - a typical daily scene. John Ratcliffe purchased and prepared lunch for us every day as shown above. 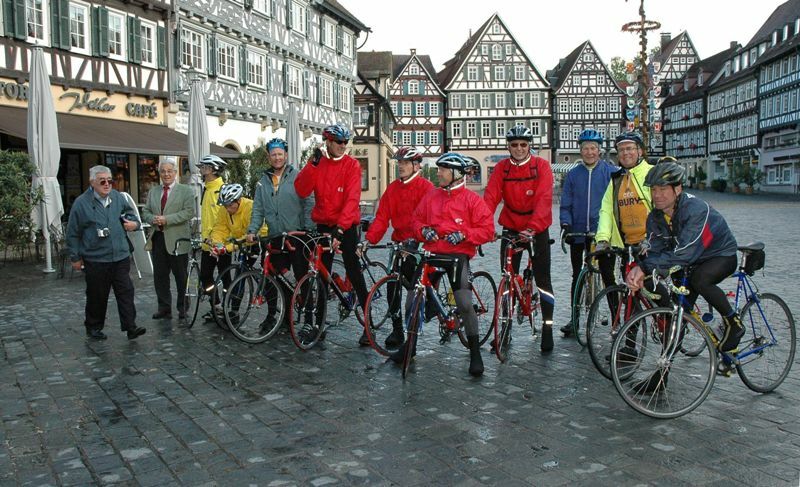 In June 2004 a group of five riders from Schorndorf - Horst, Dieter, Manfred, Siegbert and Uli - rode to Bury as part of their mission to cycle to each of Schorndorf’s twin towns – and 2004 was Bury’s turn. The riders call themselves Team Jumelage as jumelage is the French word for twin or twinning. Their trip to Bury was co-ordinated by Bury Metro Community Twinning Association (BMCTA) whose members housed the cyclists during their stay in Bury. The cyclists were greeted on their arrival at the Borough boundary by Bury cyclists including CTC and Bury Clarion members. 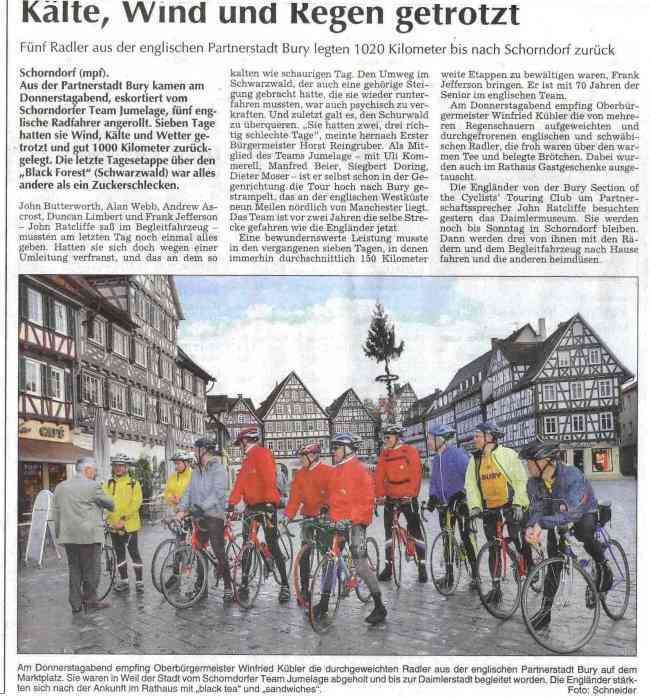 During their two day stay in Bury, cyclists discussed with them the idea of a reciprocal ride to Schorndorf. The ride started on Friday 26th May. The ride took seven days from the Friday to the following Thursday 1st June. On this last day we were met by Team Jumelage at Weil der Stadt and escorted by S-Bahn train to Waiblingen for the rest of the ride into Schorndorf. We had a reception at the Town Hall and we stayed in Schorndorf as guests of local families for three nights prior to leaving on the Sunday and arriving back in Bury on Monday 5 June. The route 602 miles (969km) is similar to that followed by the Germans (but in reverse), with revisions to take in the area around Ypres in Belgium. For more pictures of the tour go the the 'Bury to Schorndorf Photos' page on this website. The above map shows the general direction of the route after disembarking at Zeebrugge (map copyright of multimap.com). The previous day we rode 160 km (99 miles) from Bury to Hull. The red dots indicate our overnight stops. 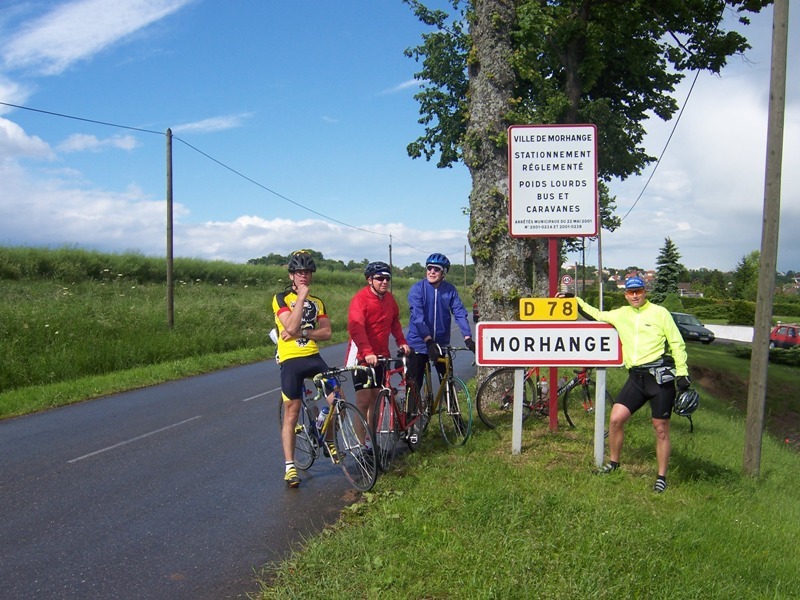 The total distance cycled was 969km (602 miles). This was 30 or so miles shorter than planned due to an unavoidable transfer by S-Bahn train from Weil der Stadt to Waiblingen on our last day into Schorndorf. Below: In June 2004, Bury cyclists greet the Schorndorf cyclists on their arrival at the Bury boundary. Below: June 2004. Time for a photograph at the Bury boundary sign on Bury And Rochdale Old Road before riding to the Town Hall.